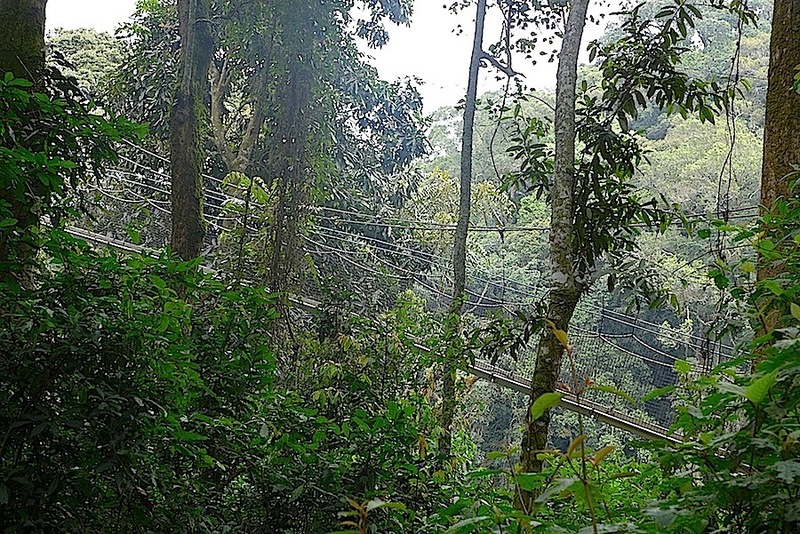 Last February, we took our visiting oldest daughter to Nyungwe National Park and hiked the first half of the trail that includes a tree canopy walkway. Last week, with second daughter and friend in tow, we completed the entire circuit. The hike started with us tucking our pants legs into our socks (against ants) and receiving walking sticks. 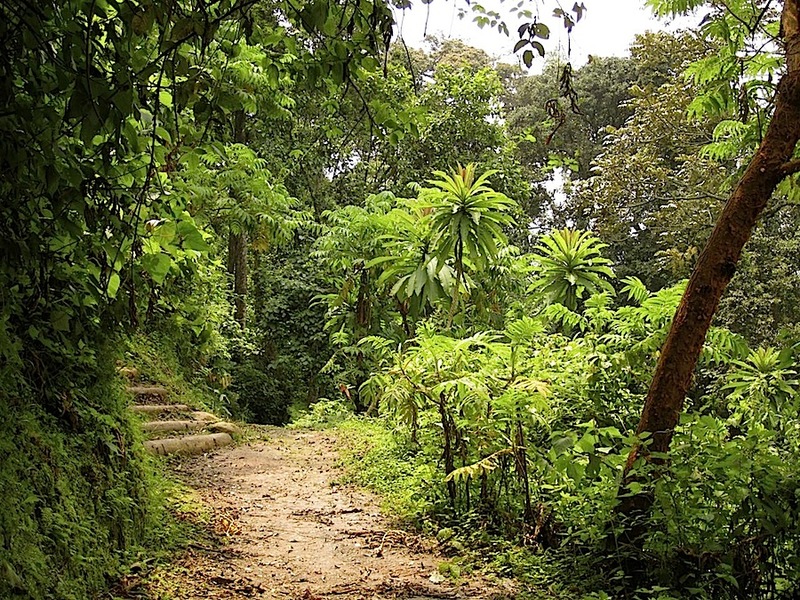 Although the paths are well-maintained, the sticks are necessary for the steeper, sometimes slippery sections. It was a hazy day, so I can’t show you the great mountain views that are otherwise visible along the way, but you can click here to see my photos from last February. 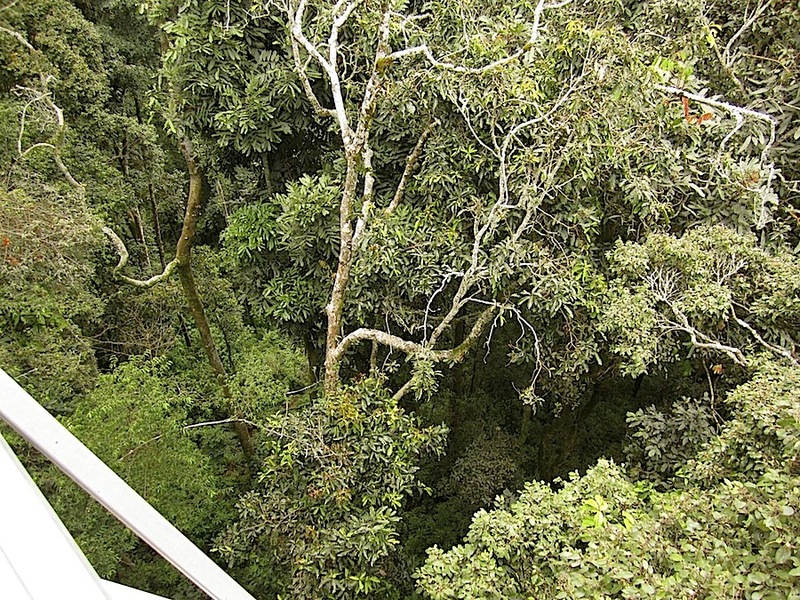 Above: We arrive at the beginning of the canopy walkway. 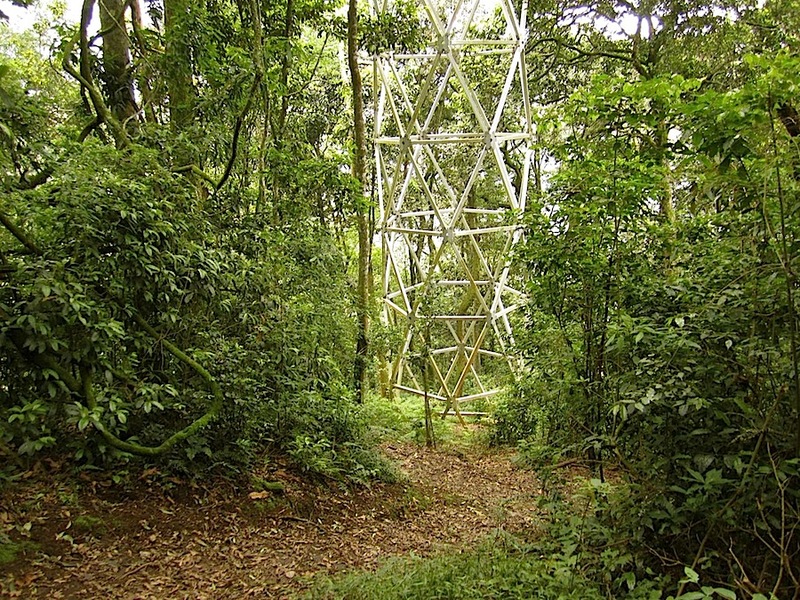 Above: The middle and highest section is 187′ (57 m.) above the ground. This time, in a group of about fifteen — with eight people crossing the walkway at a time — the shaking made me keep my eyes on the back of the person in front of me. 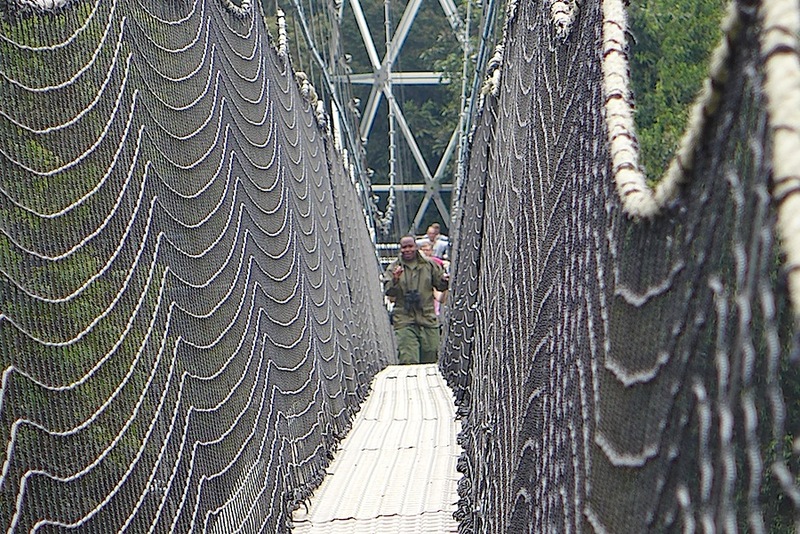 Above: Our guide starts across. Above: I did look down after I reached the top of the second tower. Above: Back on the ground below the second tower. 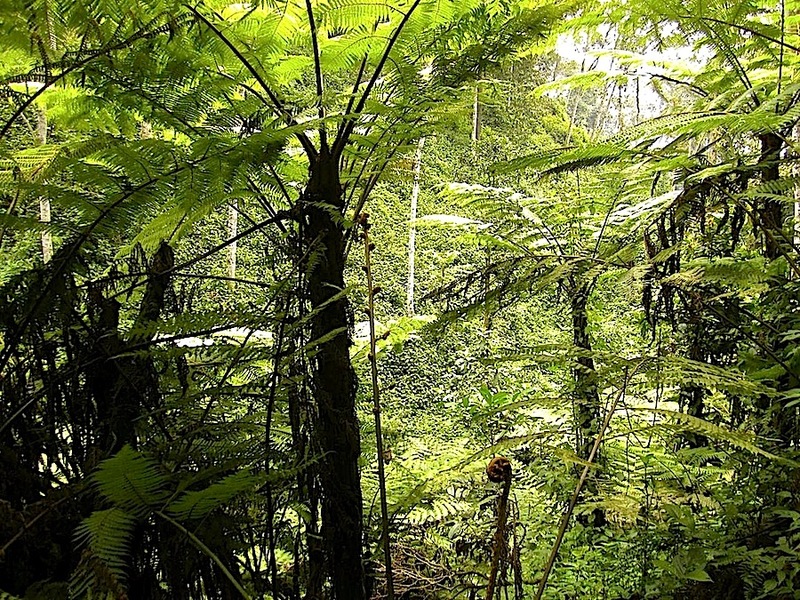 When you cross the middle section of the walkway and (dare to) look down, you see a narrow valley of tree ferns and hear the moving water of a stream. The second half of the hike continues on to that valley. 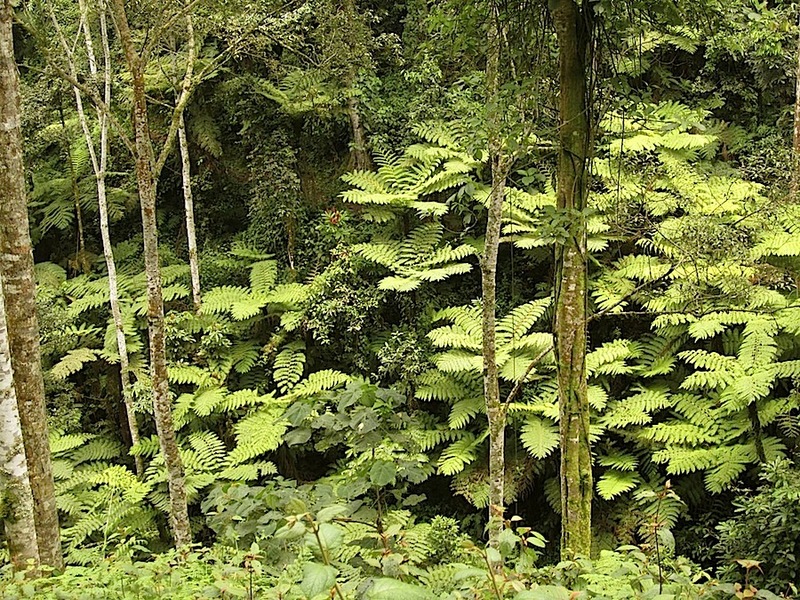 There, we saw hundreds of the tall ferns. 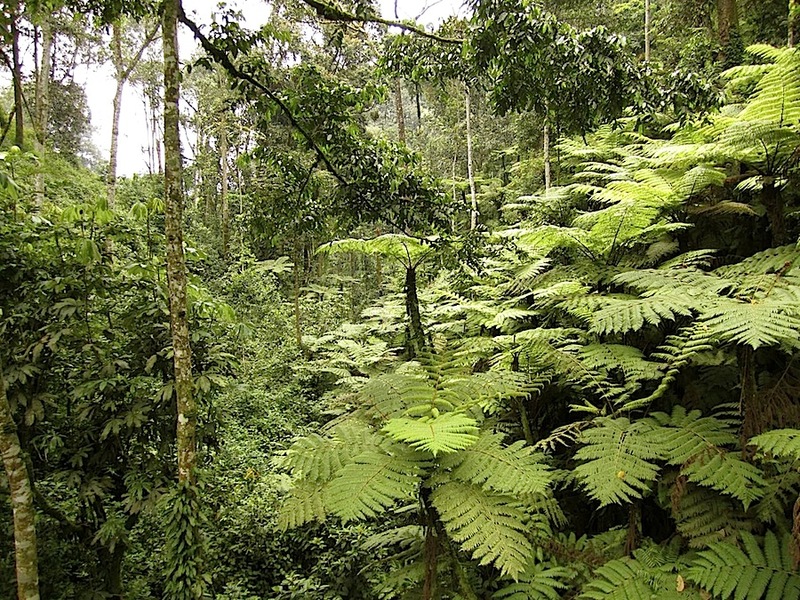 In fact, this trail is named — in Kinyarwanda — for the tree ferns: the Igishigishigi Trail. 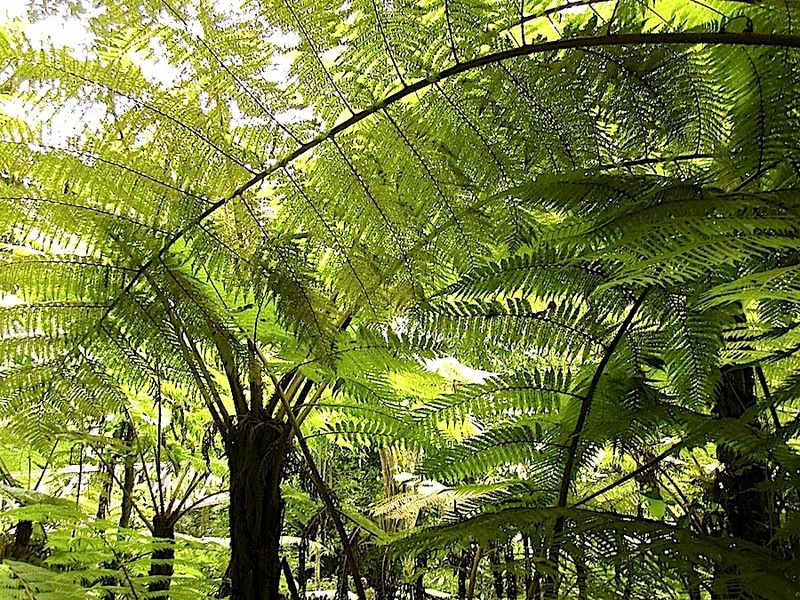 Cyathea manniana is one of two tree ferns in the park. The other is C. dregei. 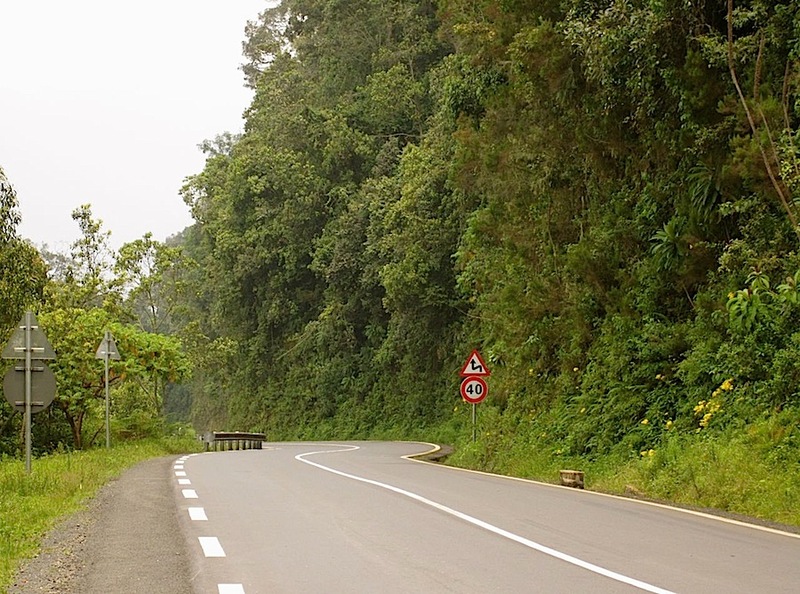 Manniana only grows in undisturbed forest, while dregei can be found along the sides of the road through the park (it also has persistent old leaves). 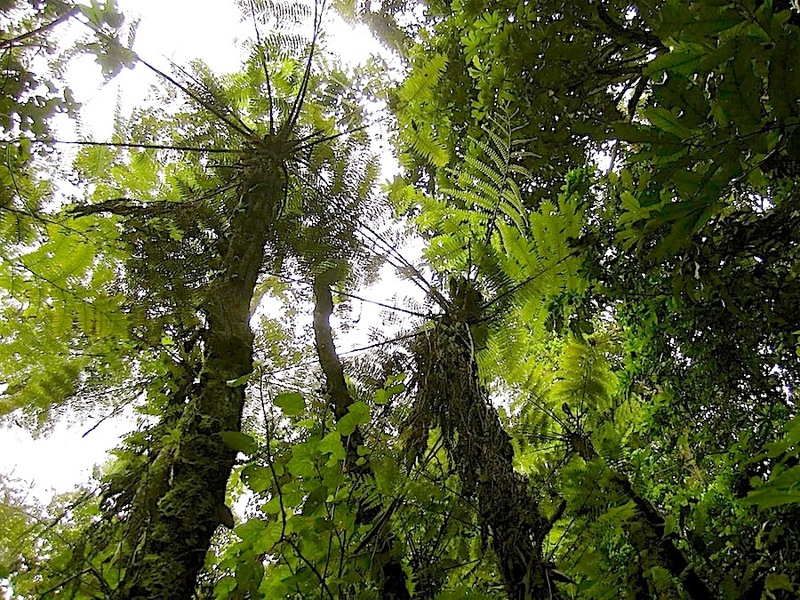 Above: Looking up into the ferns. 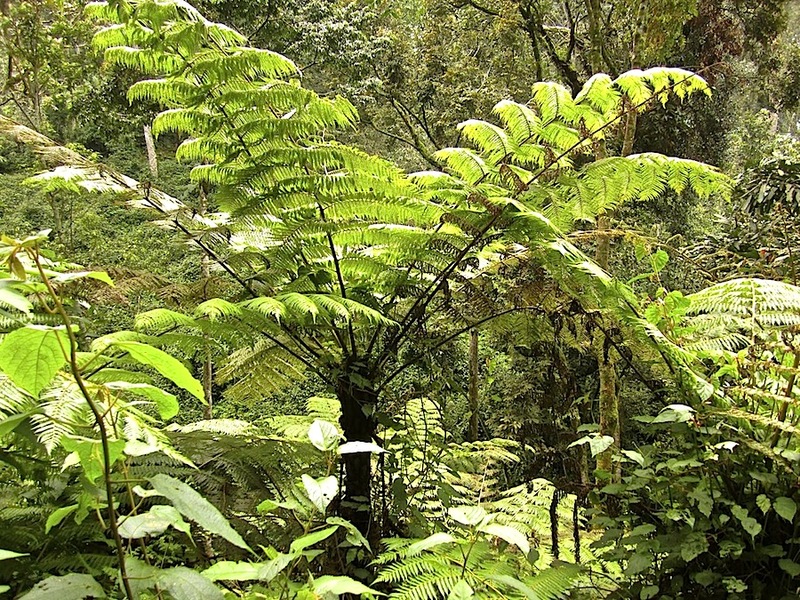 C. manniana can grow to almost 20′ (6 m.) tall. “C. manniana is traditionally used as a medical plant to treat snake bites,” according to my field guide. *** There are nine kinds of snakes in the park, but only one is poisonous. 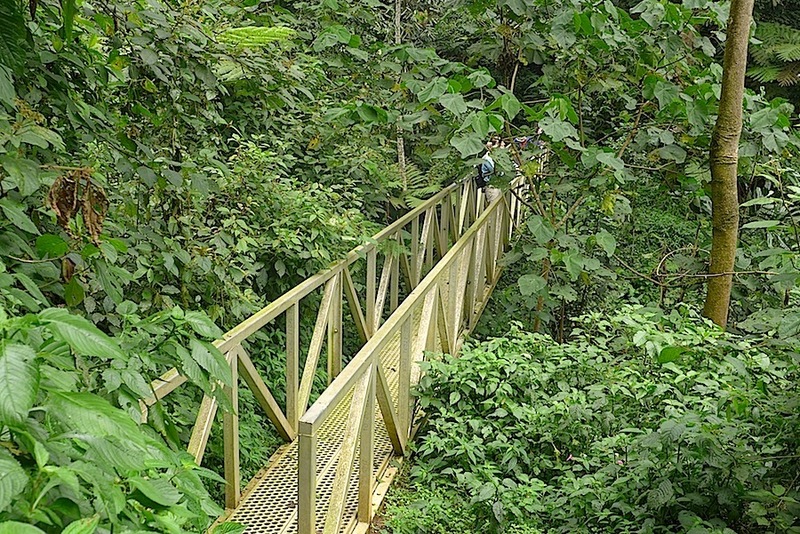 Above: A small bridge crosses the stream that we heard from the canopy walkway. The guide meant to take us down to the water, but there were too many biting ants on the path. 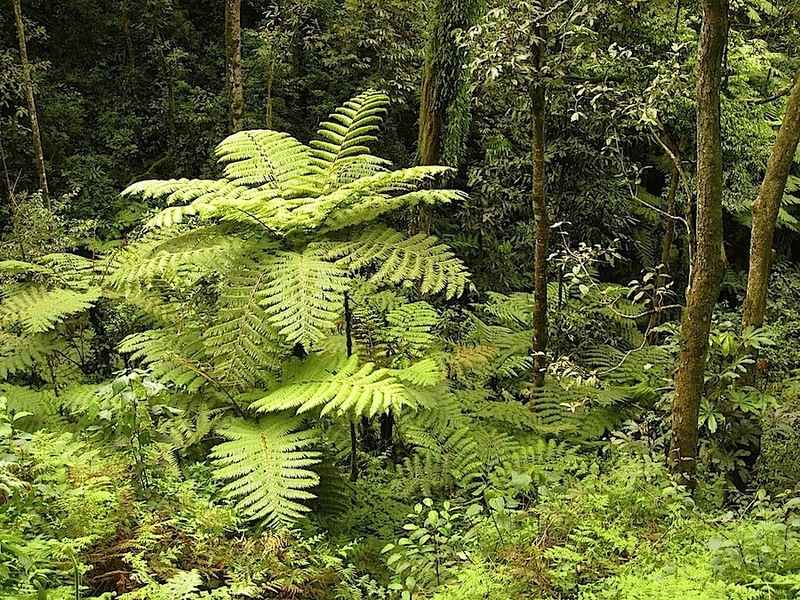 Tree ferns are one of my favorite plants, but unfortunately, they would not grow well in the cold or the heat of our Washington, D.C., garden. 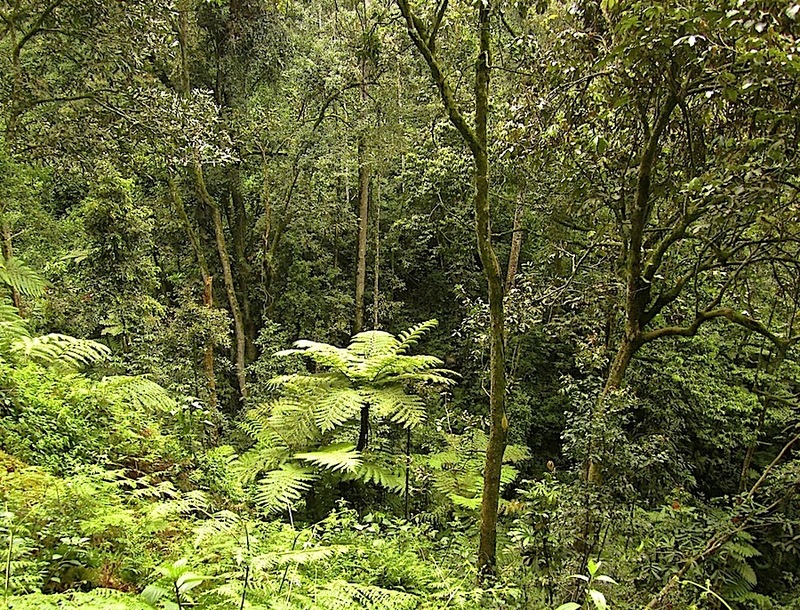 Above: Leaving the ferns behind, we started back to the welcome center. The Igishigishigi Trail is 1.3 miles (2.1 km.) long and takes 1 1/2 to 2 hours. It is rated ‘easy,’ but a large part of it involves descending and ascending steps. It’s a solid workout. 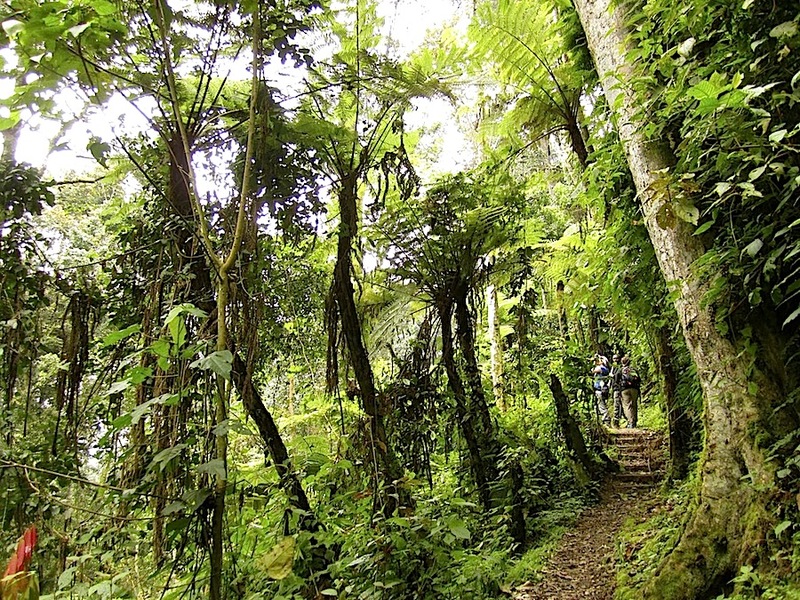 The trail begins at an elevation of 8,038′ (2450 m.) and descends to 7,530′ (2295 m.). Above (on the right): Nearing the final set of steps, we found a large group of Lobelia gibberoa or giant lobelias. With their long candles of greenish white flowers, the plants can grow to 29′ (9 m.) in height. Latex from the stems is traditionally used to treat irritation from stinging nettles. 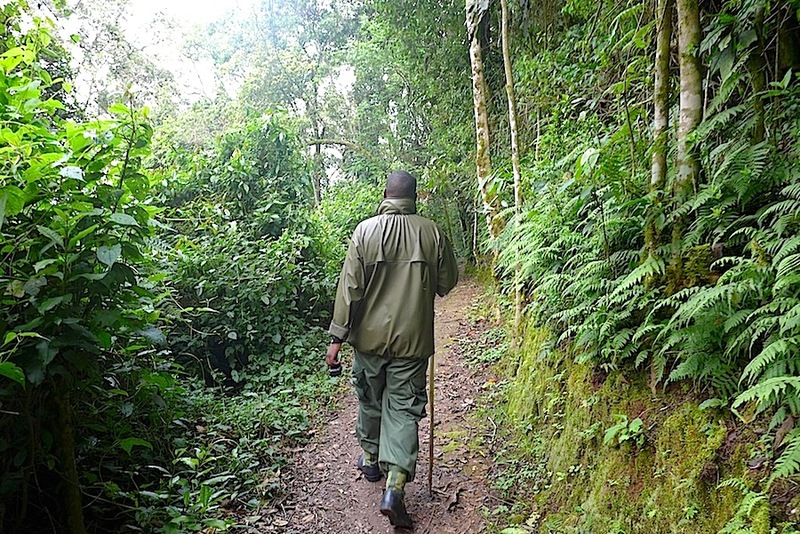 Above: After the hike, we went back to the Nyungwe Forest Lodge on the Huye-Rusizi Road. The yellow flowers along the edge are a Senecio species. *from “Ex Libris” by Eleanor Wilner. 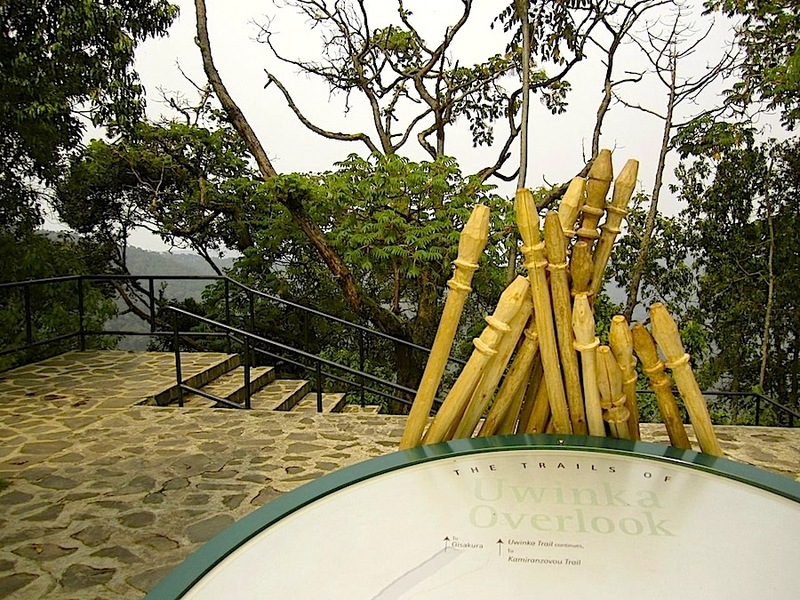 ** It’s also quite possible to see turacos flying from tree to tree from the pool at the Nyungwe Forest Lodge. 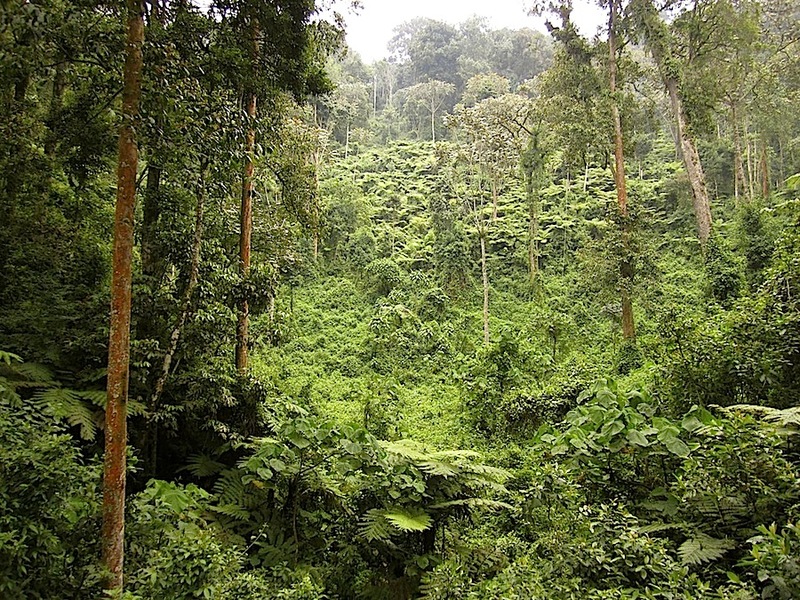 ***An excellent book about the park is the Illustrated Field Guide to the Plants of Nyungwe National Park [of] Rwanda by Eberhard Fischer and Dorothee Killman. It’s 770 pages long, with color photographs of 650 plants. You can buy a copy here. Unfortunately, it’s $71. Some copies were printed for the Rwandan tourism office, and I bought mine in a Kigali bookstore for about $25, but I haven’t seen any on sale here for about a year. utterly exotic, imagine the sounds and the heat would add to such an atmospheric journey. thank you for sharing! The sounds, yes. But not heat; most of us were wearing light sweaters. 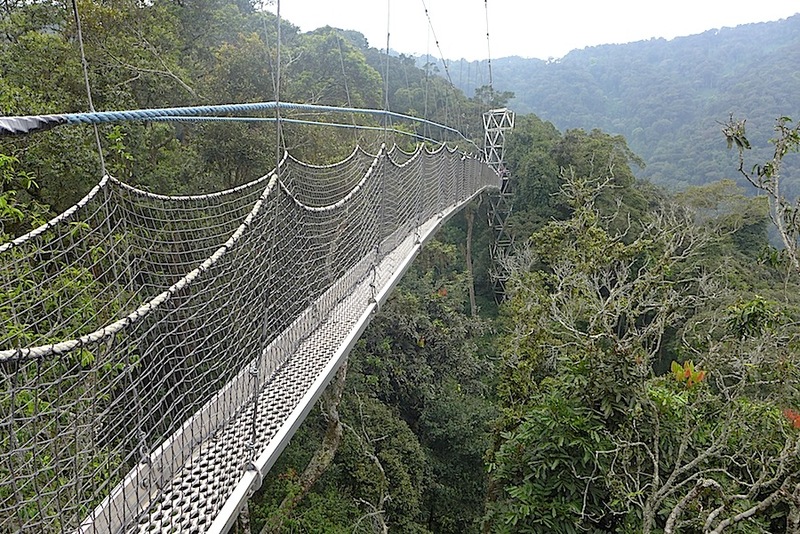 Because if the altitude, temperatures in Rwanda are usually like late spring in the U.S.
Looks magical but I am not sure if I could make it across a bridge that sways! I have a little thing with heights, and my legs got very shaky about half way through this time. But I really wanted to see what was on the other side.